There is a very large network of underground tunnels and quarries all over the city of Paris, which span more than 300km. However entry to the tunnels and the catacombes is restricted to a certain area for safety reasons and since 1955 it has been illegal to enter the catacombes unless permission is granted and you are accompanied by an official, but there is now one section open to the public. Now this is where the quarries relate to the Catacombes de Paris..
You see, for nearly ten centuries the cemetery close to the Saint-Eustace church in the Les Halles district had been used for burials, however it became the origin of major infections and disease for the inhabitants of the area, due to the number of improper burials and the amount of mass graves within this and many other churchyards in and around the area. There were, as you would expect, multiple complaints made and eventually the Council of the State took action and announced the removal and evacuation of the cemetery on 9th November 1785 and it was decided that some of the old quarries would be utilised for this purpose. It was decided that the bones should be moved at night and a blessing would be given, then a procession of priests would sing a burial service on route to their new destination in the Catacombes. 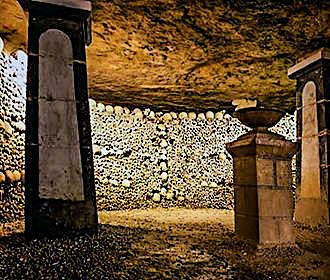 And the first bones were removed and placed within these old quarries on the 7 April 1786 and this ritual continued right up until 1788, but the catacombes were utilised right through to 1814 to collect bones from many different cemeteries in Paris. 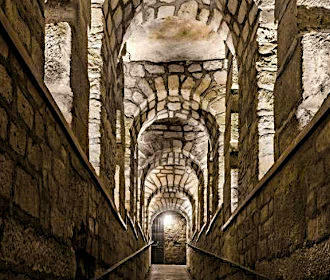 Today the Catacombs in Paris have the remains of around six million Parisians that were transferred from cemeteries across the city to the transformed old limestone quarries and have been a curious fascination to people ever since. Having been closed to the public for thirteen years, a section of the catacombes is now back open where people can discover a labyrinth of obscure galleries and narrow tunnels with the bones laid out in a romantic-macabre type of decoration. And this underground museum in Paris allows you to see the different graffiti adorning the walls and pillars from the 18 century along with the sculptures of Port-Mahon in a gallery that were produced by a quarryman called Decure. In fact, he was a veteran of the army in the time of King Louis XV and was held captive within the Port-Mahon fortress and this model that he carved into the wall has now been fully restored and exposed with special lighting, so that visitors can experience even more about the history of Paris. Now as you can imagine, this is an unusual museum and not really suitable or advised for young children and with this in mind, no child under the age of 14 can enter the catacombes unless accompanied by an adult. 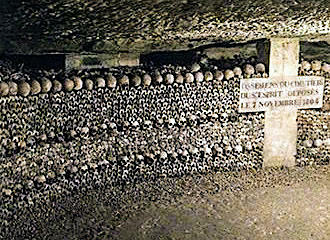 A visit to the Catacombes de Paris is also not recommended for any person suffering any cardiac problems, respiratory weakness or nervous disease plus it only has a temperature of around 14 degrees. It is also not accessible to the disabled or those with mobility problems as there are 130 steps going down and 83 steps going up in addition to the fact that the length of the walking visit is 2km. There are also no toilets or a cloakroom and the visits are limited to a maximum of 200 people at a time for safety reasons, which does mean that at certain times of the year you may have to wait, before being allowed to enter. However, if you are interested in discovering this museum of the Catacombes, then as of 2016 the cost of entry is €12, however for those aged 18 to 26 it is only €10 and if you really want to take someone younger, then those aged 17 or younger are free of charge, plus there are also audio guides available in English, French and Spanish at a cost of €5. The Catacombes de Paris are open on a Tuesday to Sunday from 10am through to 5pm but the last admission is at least one hour prior to closing, plus they close on a Monday and on National French holidays. Located in the 14th Arrondissement of Paris, the nearest Metro station is called Denfert-Rochereau, which is the same for the RER train station, plus you will be able to get here by bus on numbers 38 and 68. 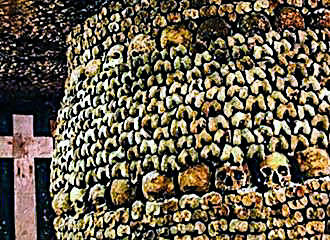 The Catacombes de Paris is the famous mass burial place for millions of Parisians that were relocated to old limestone quarries underneath the city of Paris towards the end of the 18th century and have since become a place of intrigue plus one of the more unusual tourist attractions in Paris. Now many of you will know that there are a lot of tunnels and quarries underneath the city of Paris, which have often caused problems for planning and construction, especially when a quarry could cave in causing damage to the buildings above. So, in order to prevent this, in the year 1777 the Inspection Generale des Carrieres, or IGC for short, was established in order to monitor the stability of the quarries and also prohibit the digging of any new quarries, but there were some access tunnels dug as observation tunnels for better access and the monitoring of the underground network, which still continues to this day.